“Are you the pastor of the house church on campus?” we asked Miriam on the college campus where we taught in East Asia. M: No, I am the servant of the church on campus. Us: Oh, really, we thought you led the group. M: Oh yes, God is guiding us. Us: So you are the servant of the church? Us: And who serves you? Yes, Miriam led the group, but she understood leadership as “the one who serves the group.” (This example is also a lesson in “if you ask the wrong question, you may get the wrong answer.”) Miriam and other Chinese co-workers exemplify, by the titles and words they use, that godly leadership/ influence/ power comes through service. The redeemed community lives with a different pattern of leadership – servanthood defines power, authority, and leadership in the kingdom. 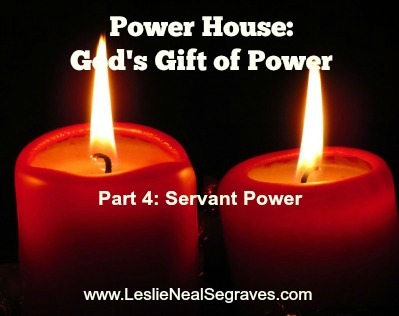 God’s view of power involves its release, not its pursuit. Who among us really wants to practice any little bit of this teaching of Jesus? It goes against human nature and it requires a supernatural focus with a different standard, a different kingdom. I’ve often pondered Matthew 4:8 when the devil took Jesus to a very high mountain and showed him all the kingdoms of the world in their splendor. The tempter offered Jesus, “All this I will give you if you bow down and worship me.” Jesus did not dispute Satan’s ability to offer the authority of all world’s kingdoms. Just think for a moment… without the cross Jesus could have ruled the world. Instant power, no pain. Instant world rulership, no shameful sacrifice. Satan offered Jesus a kingly reign without humble service. Yet, Jesus did not at all back down from godly power. After his resurrection in Matthew 28:18, Jesus began the commissioning of the Church by stating, “All authority in heaven and earth has been given to me.” Jesus’ agonizing death and his subsequent defeat of death gave him legitimate power – because it came God’s way. Patient, painful, service and sacrifice led to eternal authority properly bestowed upon him – in the right way, at the right time. Did you catch that? Sacrificial service will multiply and take on a life of its own. In Jesus’ kingdom, true power comes from a willingness to serve in dirt (i.e. humanity and/or death) and true authority follows resurrection. Just as the Father honored Jesus through the resurrection, he will honor Jesus’ followers who serve in Jesus’ way. I am not sure we see this type of leadership very often – if ever! And yet, this is the kind of leadership God calls each of us to who proclaims to follow Christ. David Hamilton wrote in Why Not Women, “If we’re preoccupied with maintaining our status, if we’re trying to protect the privileges of some hierarchy taught by our particular culture, we are acting in a non-Christian way. These reactions are the opposite of the Gospel message” (Why Not Women, 2000:139). I think this statement can challenge men who may want to protect their position and it can challenge women who may seek to fight for positions. The spheres of family, work, society, and mission all require men and women to participate. Neither men nor women should slack off or hide behind the leadership of their spouse. Men need to step up their service and share their power. Women also need to step up in service and share their power. Christians should not shy away from either Christ-like service or godly power, because by both of these means Jesus’ upside-down strategy can uproot “the way of the Gentiles” and reveal his kingdom to the world. Join the Conversation: Do you see yourself as a servant in any leadership positions you hold? How could following Jesus’ example of servanthood challenge your current style of leadership (or lack thereof)?